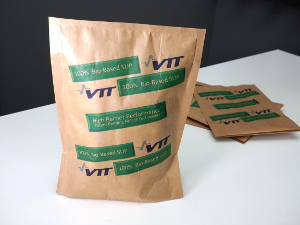 VTT Technical Research Centre of Finland has introduced new stand-up pouches made from renewable raw materials and nanocellulose. The new lightweight 100% bio-based stand-up pouches uses different biobased coatings on paper substrate, providing high performance in both oxygen, grease and mineral oil barrier properties. VTT senior scientist Jari Vartiainen said: "One-third of food produced for human consumption is lost or wasted globally. Packaging with efficient barrier properties is a crucial factor in the reduction of the food loss. Offering high technical performance, the pouches are manufactured using VTT's patent pending high consistency enzymatic fibrillation of cellulose (HefCel) technology. VTT said that the HefCel technology provides a low-cost method for the production of nanocellulose which results in an increase in solids content. The nanocellulose with densely packed structure of films and coatings provide improved oxygen, grease and mineral oil barrier properties. Nanocellulose are said to be potentially very useful for a number of future technical applications, according to VTT. According to estimates, the use of stand-up pouch packaging type has been growing at a rate of 6.5% per year from 2015 to 2020. Recently, the VTT researchers, as part of the European Union's Reffibre project, conducted tests which indicated that the ash and sludge from paper and board industry have potential to replace up to 50% of oil-based polypropylene in injection-molded or extruded plastic composites. Image: The VTT’s new bio-based stand-up pouches. Photo: courtesy of VTT Technical Research Centre Of Finland Ltd.